This seat is not your regular office chair.It comes with a unique touch of finishing that makes this the most fashionable office chair. The ribbed mid-back and the sleek aluminum base are ones that hard to find in any other chair. 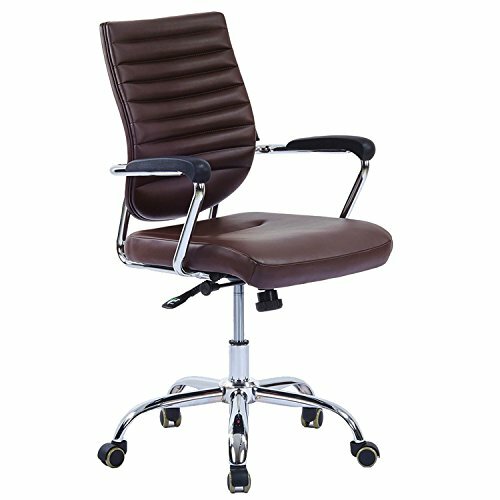 This office task chair is truly a blend of long-lasting and high-quality material. The leather fabric has an excellent reputation especially when well stitched on any furniture, this being one of them. The sturdy aluminum base is very strong to easily accommodate your weight comfortably. This chair is one designed to allow you to move around on it easily and comfortably. Starting with the great 360-degree swivel; ensures you to swing round to reach out to all corners of your working area or office. The reclining feature is also very notable in that it allows you to lean back and still perform your duties adequately. This is by far one of the most comfortable office chairs of this generation. The upholstered design that is well padded ensures you maximum comfort throughout your working hours. This is amplified by the nylon armrests, and more so the reclining ability allows you to relax in between your work shift. The comfort is also taken to a whole new level where it allows you to adjust its height and safely lock it at the desired height. View More In Task Chairs. If you have any questions about this product by LSCING, contact us by completing and submitting the form below. If you are looking for a specif part number, please include it with your message.